I've long heard of Malabon because of their food products sold here in Manila. 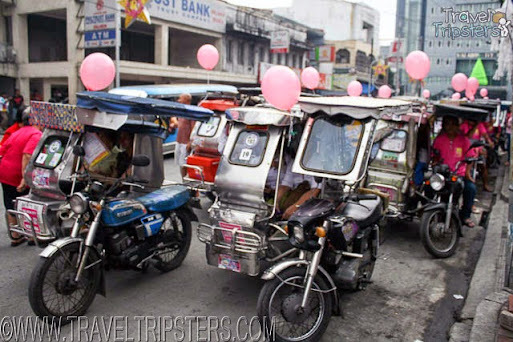 But, I have no idea that are a lot of heritage and cultural spots in Malabon until I participated at the Malabon Tricycle Tour (part of the #VisitMalabon2015 campaign) organized by the Malabon Tourism and supported by the Department of Tourism. the campaign is led by Malabon Mayor Antolin 'Lenlen' Oreta III's chef-wife, Melissa Sison-Oreta. We begun with San Bartolome de Malabon Parish. The San Bartolome de Malabon Parish just celebrated its 400th anniversary. 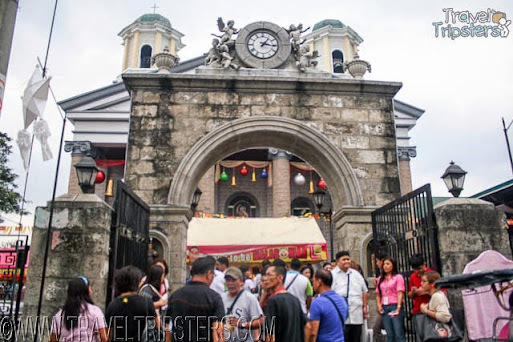 It was established by the Agustinian friars on May 17, 1614. It has twin bell towers that houses seven bells. It has a Greek-Roman style facade with the triangular top and columns as support. It has a beautiful golden carved wood door. Outside by the door, we also saw these old bells. Although preserving is baroque architectural structure, the church was been redressed with stunning colorful paintings by their local artists. With our very polite and friendly tricycle driver Abril Santos, my friend Sumi, Francis and I left St. Bartoleme Church to head of to Concepcion Market. Even during the mid-day, the Concepcion Market was busy. 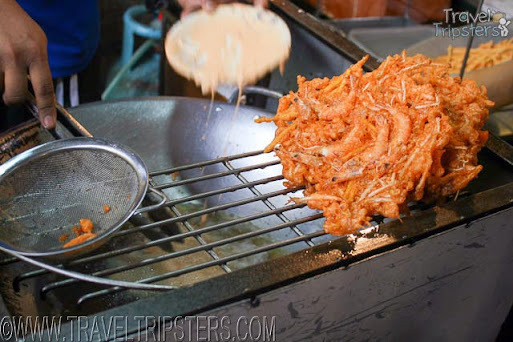 I couldn't help but stop to sniff the fragrant smell and listen to the delicious sizzles of the crispy Okoy (battered shrimp and beansprouts) being freshly made. We then set off to Artes de Paseo Gallery where we got to see wonderful artistry and the paintings displayed are all for sale. I really the work of Chris Magbuhos. His oil paintings are really astounding with the wonderful mixture of shapes, textures and colors. On the field of acrylic painting, I'm piqued by the art pieces of August Santiago. We had the Valencia for snack. It was my first time to try it. The Valencia is a deep.fried caramel-coated triangle-shaped snack filled with banana and Biko (sticky sweet rice). The Ibaviosa's House is originally made of bamboo and nipa. It was built in 1940's as fruit of the Ibaviosa's success from the Patis-making industry. Thus, at the back is a factory for patis. Patis is the main industry of Malabon. There's also a small factory for pants. Too bad they don't sell in retail. Their items are directly delivered to retailers. 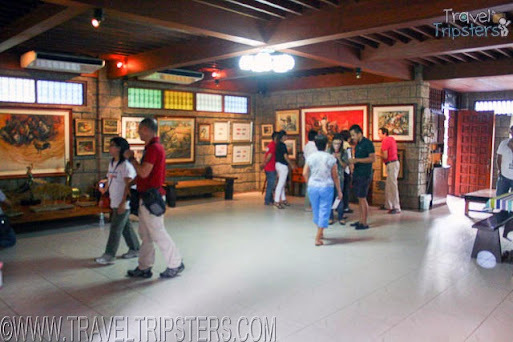 My favorite stop is the house turned gallery of Angelo Cacnio, a multi-awarded National artist whose paintings were used in our Philippine 20 and 100 peso bills circulated in 1982 and 1983. He also designed the Malabon Landmark icon in Letre Road. Even the architecture of his house alone is worth the visit. 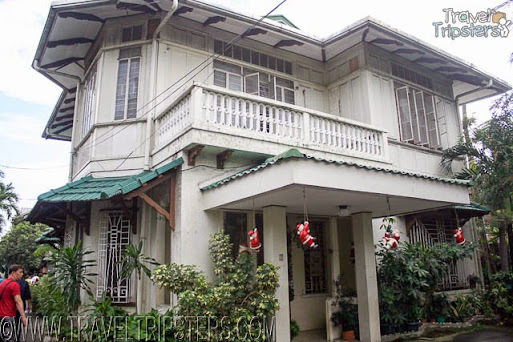 It reminds me of our ancestral Vigan home. Upon walking in the Angel Cacnio Gallery, I found his works to be not only patriotic but very colorful and striking as well. Our fifth stop is the Raymundo's House which had a gate built in 1981. I never imagined how sturdy gates were during those days. The thick concrete boulders held the humongous wooden doors well. On top, there is an Hapsburg Eagle symbolizing royalty. The roman numbers indicate the year it was established. This property used to host seafood trade during those days. Malabon City's economic progress has paved way to the establishment of the Oreta Sports Complex. This is built only in 2006 and is constantly being renovated. Aside from the courts, it also has two outdoor pools at the back available for the public: 1 big pool and 1 kiddie pool. Our last stop was the 11-storey Malabon City Hall. It was so cool with lots of elevators. We got to check out the top floor where they have a Multi-purpose hall, an indoor airconditioned and sound system equipped hall for public events. It also leads to an open air penthouse. 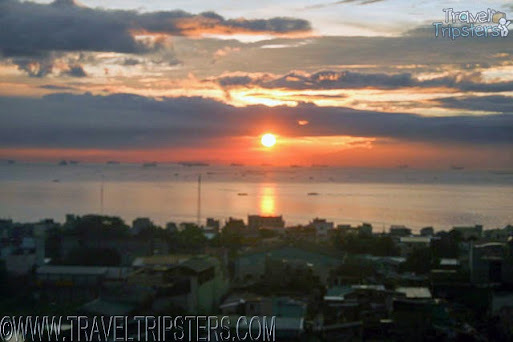 We got to view the beautiful sunset, the town of Navotas and the entire Malabon City from there. Overall, we Travel Tripsters highly recommend for you to try this out. It's just an hour away from Manila utmost. It's very affordable and one-of-its-kind. You can add restaurant stops to and negotiate a reasonable rate for it. For more information call the Malabon Tourism Office: 281-4999 Loc. 1003 or call/text the Malabon TODA Association at (0918) 651-7343 | (0922) 950-1500 | (0922) 809-3010.